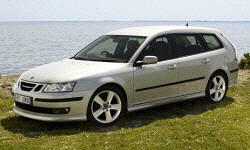 Why the 2007 Saab 9-3? Excellent highway passing capability. Smooth transmission in either mode. Safety features galore. Brakes do the job in every situation,particularly in emergency. Very precise and accurate.....car goes where it is aimed. Combination of power seat and tilting/telescoping steering wheel makes for outstanding comfort over a long day on the road. With large rear window in the SC and adjustable outside rear view mirrors,there is no blind spot to speak of. Why Not the 2007 Saab 9-3? MSRP is much higher in Canada compared to USA. Price of parts is excessive. Generally good materials(I have 60th Ann interior)but there are a few gaps in sections of instrument panel. There are annoying squeaking sounds,particularly from sunroof when on other than normal road surface. Wind noise is not bad,but road noise at highway speeds coupled with noise from suspension when hitting any surface irregularity is not what I expect in a car in this price class. Because of higher cost of repair parts,insurance premiums are higher than other cars in this class,according to State Farm. Excessive MSRP leads to very high depreciation. Car has a nice firm sport suspension but on anything but smooth pavement,the shocks do not seem to be able to cope with bumps.